Episode 26: Who Judges the Judges? 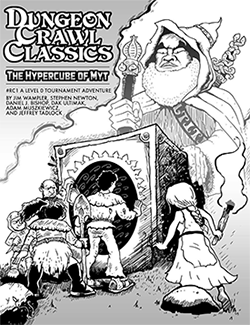 And don’t forget to check out this episode’s winning Dungeon Denizen entry by Mighty Mike Loew! Now, who will take on the Bittman and the Brinkman? Meh…I don’t know if I’ve been in the “public” eye long enough to make a real impression. Thanks, Daniel, glad you enjoyed this foul-mouthed manphibian! The Bitman was the first creature design. It’s an anagram. I thought the blue hair would be a give away. See, why’s it gotta be foul? You heard her….it has to be fowl! What about the link to the dice analysis? I heard tell you were going to put that in the show notes? Hope you find it useful, Joel! Thanks for posting it Judge Jim! Good show guys. It’s interesting to listen to your ideas on running events, and see more deeply into your styles! I also like the talk about multiple judges. I’ve always thought it would be really cool to have one judge actually play the enemies/creatures. It would be a way for someone to focus entirely on the personality of the beasts and make them even more memorable, and allow the main judge to focus on the rolling, rules, etc. I like it, but I think it’d wear thin if done regularly (I don’t see a weekly home game being a good venue for this sort of team). Thanks for giving The Toadlock his moment in the sun, Spellburners! I hope some judges out there enjoy using his curses. It’s good fun to croak out his rhymes and watch your players’ eyes get bigger and bigger, wondering how bad it’s going to be. You did an awesome job with that one, Mike!